Hello, having similar issue to another case someone opened and you closed with no published solution labeled "PF8" on Nov 8. I'm running OS 10.13.6 on a MBP 13" Touchbar (2018). When I launch for the first time the purchase window opens up but keeps expanding from the bottom when clicking anywhere on it that I can no longer see the bottom of the window and I have to force quit or manually close the window under file->close window. When I open the window again, I'm presented with the Buy Later or Purchase option but when I click to Purchase (or Buy Later), the window just expands down every time. I have no way to resolve this. I've attached the window before it expanded out of view. I have deleted the preferences file, i have de-installed and re-installed PF8 8.3.3. And i have an upgrade license code for PF8 that i have no way of entering in. HELP! They are working on the fix. Path Finder Support Team closed this discussion on 10 Nov, 2018 02:43 PM. 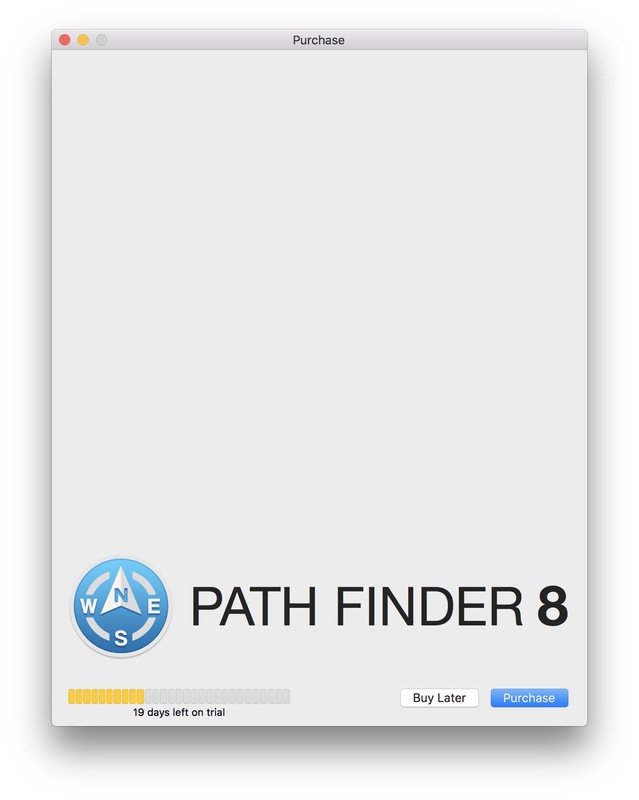 May I ask you to check if you see any logging messages from Path Finder when you click the "Buy Later" button? In case there are any messages, please attach them in a .txt file here. We have another update for you on this issue. I also have this issue. I tired the special; sma behaviour. I have followed the instructions to completely remove Path Finder. Although I was unable to adjust the preferences and some of the files mentioned did not exist. I have tried now with PF8.3.6. Same behaviour. Sorry to say I'm getting off here. I don't wish to spend any more time as a crash test dummy. Good luck sorting this out. You should be able to close the purchase window by hitting either cmd+W or Enter. After that you will be able to use this functional window via Path Finder > Registration > Purchase. Another known workaround now is to upgrade to macOS Mojave. Path Finder Support Team closed this discussion on 04 Dec, 2018 04:23 PM. Sorry you are incorrect. Nothing will close the window except force quitting the application. Making it unusable. Others seem to have the same issue. At this time I am unable to upgrade to Mojave. Are you saying that PF 8 is unsupported in 10.13.6? PF8 is compatible with Mojave. This issue is quite rare but happens to some of our users, unfortunately. I can provide you with a PF7 license if that works for you, as a temporary workaround. Path Finder Support Team closed this discussion on 04 Dec, 2018 05:30 PM.